For a better value try Taurus SC. Also, available in a larger 78 oz. size. 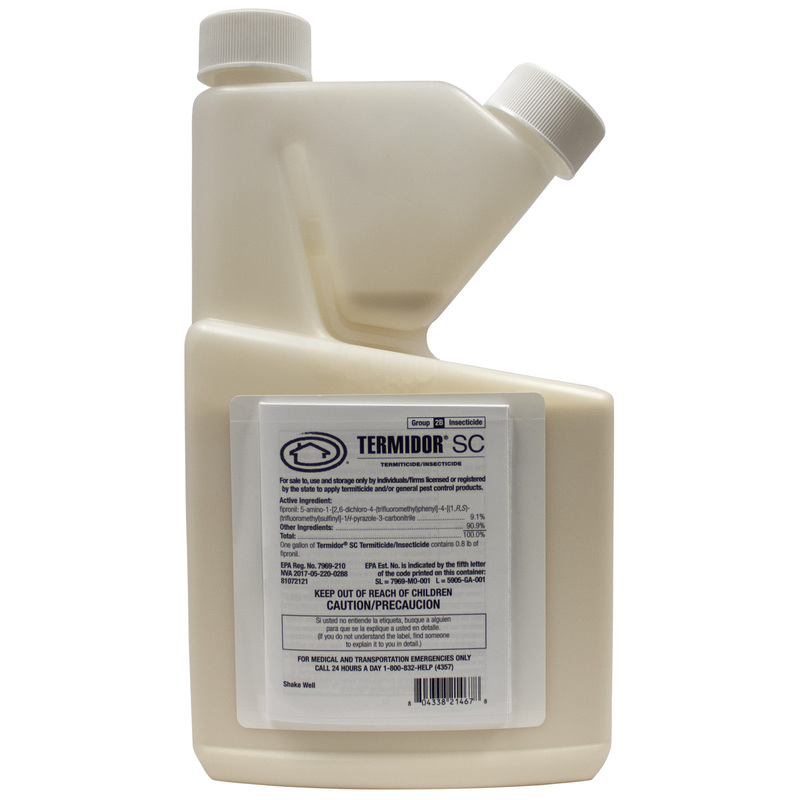 Termidor SC (the SC stands for Suspended Concentrate) is an excellent professional termite control product for killing termites and protecting your home from future infestations. In addition to its superior protection against termites, Termidor is an excellent do it yourself pest control product to have on hand as it also kills ant colonies, as well as many other insect pests. Termidor will protect your home and eliminate almost any termite problem in less than 90 days. In addition, when used as an in-ground barrier treatment, Termidor will protect your home or business for over 10 years. Termidor is completely undetectable by termites and once termites touch it they contact, ingest and spread the termiticide until it eliminates the entire colony. Termidor controls all types of termites including subterranean, formosan, and drywood termites. Want to know how to get rid of crazy rasberry ants or how to treat crazy rasberry ants? Termidor is the answer for crazy rasberry ant control, as well as all other ant species. Termidor is labeled for OUTDOOR use only. It can only be used indoors to spot treat termite or insect activity inside wall voids (for example when treating a live termite infestation in a wall void). It cannot be used indoors for ant or pest control other than inside wall voids. Termidor CANNOT be used on pets for any reason. Termidor SC is not labeled for fire ants and cannot be used out in yards for ant mound control. Termite Pre-Treatment: Use 1 gallon of finished solution per 10 sq. ft.
Each 20 oz. bottle will make 24 Gallons of Solution and will Treat 16,600 sq. ft.
* Will Need to Use 1.5 gallons of solution per 1,000 sq. ft.
For Termite Control, each 20 oz bottle will make 25 gallons of solution and treats 60 lineal feet of trenching. For termite pre-treat use 1 gallon of finished solution per 10 sq. ft.
Transcript: "Hey I'm Chris the Bug Guy from Domyownpestcontrol.com, and today I'm going to show you how to get rid of termites using Termidor SC. Termidor SC is considered the #1 non-repellent termiticide on the market for treating termites with the active ingredient fipronil. Most professional companies provide Termidor termite treatments because once you apply it, it lasts for over 10 years, and it kills termite colonies in as little as 90 days. Termidor is a concentrate that comes in a 20 oz bottle. 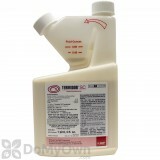 One bottle can make 25 gallons of finished solution and treat 60 lineal feet. Each house usually needs 3-4 bottles. Now let's go outside and show you how to use Termidor in the trenches around your house. Step 1 is digging the trench. The trench against your house should be 6" wide and 6" deep. You can use a shovel or a pick axe, and the trench will be directly against the foundation. Once you have dug the trench, it is 4 gallons per 10 feet, 10 lineal feet, along the house. So you are going to mix in the termiticide, make a line on the bucket if you need to for 4 gallons, and once it's mixed we're going to evenly distribute it over the trench. So we have a 10' section over here. You are going to evenly distribute those 4 gallons over the 10', and then move on to the next section. By the time you get back around this should have dissipated into the soil. Now once you have finished trenching and filling the trench with the termiticide, and it's had time to dissipate into the soil you need to put the back fill back into the trench. Now the dirt right now is untreated. This is the dirt we took out of the trench, but you want to make sure that you treat it before you put it back in because you don't want a layer of untreated soil on top of the treated soil. If termites happen to go right near the surface, they are going to skip the termiticide you placed in the trench. So this is a lot easier with two people. You want to mix some termiticide in a 1 gallon pump sprayer, and then you want to have a shovel or a rake to push the dirt back in the trench. The person with the sprayer is going to go ahead and start just wetting the dirt down, not so much that it is muddy, but just start wetting the dirt down, and as you are pushing it back in with the shovel or rake, the other person is going to wet it down. Just move on down the line. Let him wet it down a little bit. As you shovel it back in they're just going to wet down that back fill and get it mixed well with the termiticide. Now your house is completely protected by the professional termiticide. I hope you found this video useful. For more information click here." Termidor is made from a revolutionary new nonrepellent or "undetectable" chemical technology treatment. That means termites cannot see, smell, taste, or avoid Termidor. Instead they contact, ingest, and share it with their nestmates. This is in sharp contrast to older liquid termite controls, which rely on repellent barriers that termites can find breaks in or avoid completely. Termites who contact Termidor transfer it to every other termite they in turn contact, in a unique process called the "Transfer Effect." And because Termidor is engineered to be slow-acting, termites have ample time to spread it throughout their entire termite population. Baits can take years to control a termite colony. Termidor begins working immediately to wipe out termites inside and immediately surrounding your home. Termidor is the most effective and fastest at completely eliminating termite populations--up to six-times faster than bait. Chances are that the ants in your house actually have their nest outside where they travel back and forth for food and water. So, since they live outside, it makes sense to control them there. Termidor SC can be applied above ground to the exterior foundation walls of your house, creating a treated area of protection for excellent ant control. Unlike older insecticides, Termidor can't be smelled, tasted, or even felt by ants. So they crawl through the treated area, not knowing that by ingesting treated materials or merely contacting the insecticide, they'll die. Termidor is unique because ants not directly exposed to the Termidor-treated area will be controlled as they come into contact with affected ants. This Transfer Effect means you'll see its effects on ants in one to three days, and most species will be controlled within the first week following the treatment. Many people ask us if Termidor SC can be used to treat Carpenter Ants. The answer is yes. Termidor SC is one of the most effective products on the market today for treating Carpenter Ants. Termidor SC may take up to 90 days to kill termites depending on the colony size. Termites, Carpenter Ants, Crazy Ants, Argentine Ants and other ant species including crazy rasberry ants (please see the Talstar P Professional Insecticide Label). Also labeled as an outside perimeter pest control treatment only for the following pests: Asian Beetles, Boxelder Bugs, Pill Bugs, Centipedes, Cockroaches (Australian, Oriental, Smokey Brown), Crickets, Earwigs, Cluster Flies, Millipedes, Silverfish, Spiders, Brown Dog Ticks, Paper Wasps, and Yellow Jackets. Note: Termidor is not a knockdown insecticide for wasps and yellow jackets. Termidor SC is the termiticide most widely used by professional pest control companies. It is also terrific for ant control outdoors around the perimeter of structures. Termidor SC can be used for pre-construction and post-construction termite treatments, for prevention and for active infestations. Termidor SC is also labeled for several other crawling pests as an outdoor perimeter treatment. For Termite Control: To protect your home from future termite infestations, Termidor must be mixed with water and poured in a 6-inch deep trench that is dug around the foundation of the home. Please read below for more information. 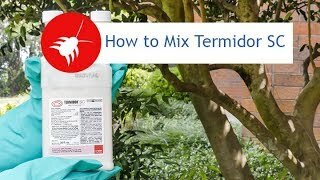 For Control of Ants and other Target Pests: Termidor is mixed at a rate of .80 fl oz. to one gallon of water in a pump sprayer and sprayed around the outside foundation of the home. For example, you would spray 1 foot up the foundation of your home, and 1 foot out onto the ground. The treatment will last about 4-6 months, and will then need to be reapplied. * For Termite control mix at a rate of 0.80 fl. oz. for each gallon of water used. * For ant and general insect control around the exterior of a structure the mix rate is 0.80 fl. oz. per gallon of water. Termidor SC is a professional termite control product for killing termites and protecting your home from future infestations. In addition to its superior protection against all types of termites, Termidor also kills ant colonies, as well as many other insect pests. How much Termidor should I buy? One 20 oz. bottle of Termidor will make 24 gallons of finished solution and will treat approx. 60 lineal feet around your home for a termite treatment. Use 4 gallons of finished solution per 10 lineal feet around the house. Example: A home with 200 lineal feet around the foundation would require 4 bottles of Termidor. Most homes require at least 4 bottles. Termidor SC is for Outdoor use only. Indoor spraying is limited to spot treatments for live termite infestations. The product cannot be used indoors for ant or pest control. Termidor is most often used as an in-ground treatment, where it is mixed and then poured in a trench around a house to create a barrier against future termite infestations. However, the product can also be applied to live termite infestations as a liquid spray, liquid dilution or as a foam application. A professional company that would come and treat your house with Termidor would usually have either a 50 gallon or 100 gallon spray rig on the back of their truck, with a hammer drill for drilling holes in your garage concrete slab, if you have one, and slabs around your house like porches and patios. Commercial rental places, such as United Rentals, may have these products. Most homeowners that apply Termidor themselves use a 5 gallon bucket. It takes longer, because you can only mix 5 gallons at a time, but it gets the job done. You should apply 4 gallons of Termidor every 10 lineal feet around the foundation of your home. Homeowners can estimate 4 gallons by using a 5 gallon bucket and only filling the bucket most of the way full. You will need to dig a small trench against the foundation of the home about 6 inches deep and 6 inches wide, into which you will pour the finished solution and mix it with the soil. It is also important to treat the backfill, which is the dirt that you took out of the trench laying next to it. If you just put this dirt back untreated, the termites could go through this untreated section and not be affected. You should either push the dirt back in right away to mix with the 4 gallons you put in the trench, or take a one gallon sprayer and soak the backfill dirt down before pushing it back in the trench. This will create a termite-proof barrier around your home that will last up to 10 years. Please read the label carefully when applying Termidor as it will give more detailed instructions and precautions. Most widely used termite control product by professional companies. Pet safe when used as directed (Termidor is safe around pets such as dogs and cats when used OUTSIDE only and mixed and applied as directed. Termidor is not labeled for use directly on pets. Convenient tip-and-pour bottle design makes measuring easy. Shelf life of 5 years if stored out of direct sunlight and extreme temperatures. An in-ground termite treatment with Termidor SC last for 10+ years. Easier, faster, and more effective than bait stations. Controls all types of termites including subterranean, Formosan, and drywood termites. The best product for invasive ant species such as crazy rasberry ants. Foam applications may be made in voids for above ground termite infestations. Do not make applications when precipitation is occurring. Do not treat soil that is water-saturated or frozen. Do not apply Termidor SC within 5 feet of a well or cistern. Treatment within 5 to 10 feet of a well or cistern must be done by backfill method only (removing the dirt to be treated and replacing it after it has been treated elsewhere or in a container such as a wheelbarrow). DO NOT apply to garage doors, driveway, vertical surfaces above the driveway or garage door, or to cracks and crevices leading or adjacent to the driveway such as the expansion joint between garage and driveway. ONLY use of the 0.03% Termidor SC finished dilution is permitted. DO NOT apply more than 4 times a year. DO NOT re-apply at intervals less than 60 days. For foundation exterior perimeter treatments, apply TERMIDOR SC finished dilution as a low pressure (25 PSI or less at the nozzle) coarse general surface spray along the foundation exterior perimeter to an area six inches up and six inches out from where the ground meets the foundation. DO NOT apply spray bandwidth at greater than 6 inches out or up where the foundation meets the ground. DO NOT make application on any date between November 1 and February 28. As a termite sales representative for a major pest control company I saw the “writing on the wall” several years ago when Termidor first became available. Why would someone pay thousands of dollars for a termite treatment and hundreds of dollars every year to maintain a guarantee when a product so easy to use and so effective was available. Two years ago, after leaving the Company, I discovered that my house was re-infested with termites. I spot treated the area where I found the termites with Termidor purchased from Do My Own Pest Control and I placed some wood monitors in the area a few weeks later; they took no hits. This past Summer I noticed some damage on my siding and as I continued to pull off pieces I found a lot of termite damage, but no termites. Termidor works because the treatment does not have to be perfect. Get some in the area where they are active and they will carry it back to the colony. There is no need to pay for costly drilling inside your home anymore. Knocked out my ant problem! First, I was impressed with just the bottle. Termidor SC is designed so you can pour exactly the right amount of mix with no trouble. Second, I have had a chronic carpenter ant problem for years. It costs a minimum of $200 for a professional to do 1 treatment, or $350 for a year. For about $70 total and 20 minutes of my time, I knocked out the ant problem. I have enough left over for at least three years. All the ants running up and down and inside my house walls disappeared in a couple of hours. There are dead ants everywhere outdoors, with a couple staggering around in circles. As a Termite and Pest Control professional, NOTHING beats Termidor SC. By far the most effective and safe termiticide on the market. Do not trust anything else to protect your home! Termites Eating My Pool Liner.... NO MORE! I couldn't figure out why my above ground pool was losing water. I hired a professional "leak buster" outfit to help me find the source. It turned out there wasn't one hole in my liner, there were thousands of tiny holes caused by moisture seeking subterranean termites! I tried treating the issue myself with some Home Depot bait stakes. That liner lasted 1 season before the pool started losing water again. I somehow found this site and started to research this Termidor stuff. I bought a jug and a pump sprayer. Since the lining needed replaced (again) I got all set up. When the old lining was removed, I soaked the sand base with my sprayer filled with the Termidor solution. I replaced the liner. Then, I sprayed the outside base of the pool and let the solution roll down the sides through the gravel. Since I had about 12 bait stake holes, I pumped them full of the diluted solution as well. I used the entire bottle on my pool. It's been two full seasons since I treated with Termidor and needless to say, I am thrilled. Not even a hint of termites! If I were to ever install a pool again, I would treat with Termidor as a preventative measure. I had no idea termites hunted for water in swimming pools. I highly recommend this product and this website! An excellent product. I do maintenance for our church and school and use Termidor SC for ant control. I was spraying or using granules every week. This product has sold me on a true ant control product that you only have to use every once in awhile. This product will save you money because of time and labor involved in normal products. Is there a difference between Termidor and Termidor SC? Is there a difference between Termidor and Termidor SC? Is the Termidor only for licensed professionals? Is it stronger? Termidor and Termidor SC are the same product, its just that no one ever says the SC part. SC stands for suspended concentrate. This is the same product the professionals use. The only difference is that licensed professionals can buy this product in larger bottles. Termidor is made in a larger 78 oz bottle, but it can only be sold to homeowners in the 20 oz bottle. What is the shelf life of Termidor SC? Termidor SC has approximately a 5 year shelf life when kept out of direct sunlight and out of extreme temperatures. However, once placed in the ground around a home, Termidor SC will last almost 10 years or longer. What is the difference between Termidor 80 WG and Termidor SC? Both Termidor 80 WG and Termidor SC when mixed with water, make the same type of solution. The "WG" in Termidor 80 WG stand for wettable granule. The "SC" in Termidor SC stands for suspended concentrate. They are just different formulations of the same product. The Termidor 80 WG is easier for professional termite control operators to carry in their trucks, and it is easier to mix. However, Termidor 80 WG cannot be sold to homeowners, it can only be sold to licensed professionals. Only the Termidor SC in the 20 oz bottle can be sold to homeowners for personal use. Can Termidor SC be applied to the surface only with no trench? If a trench is needed, how deep does it need to be? 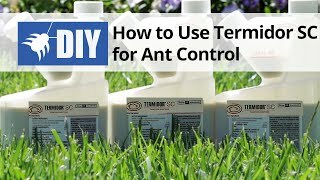 Termidor SC can only be applied to the top of the soil when you are using it as a perimeter pest control treatment against ants. 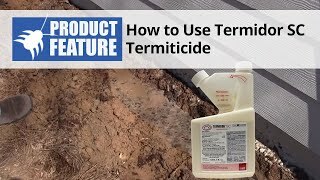 If you are using Termidor SC to treat for active termites, or to protect your home against termites, you must apply the product into a trench. This is because termites do not walk across the ground like ants do, they live beneath the soil and enter your home below the grade level of the dirt. Therefore, you must place the Termidor SC into the ground to have a chance at them coming into contact with the product. Please read our informational article written for homeowners: "How To Do a Termite Treatment" which will tell you how deep to dig the trench and how to properly apply Termidor around your home. Termidor Sc and Taurus are essentially the same product they are just made by different manufacturers. They both carry almost the exact same label and there is not any advantage to using one product over the other.